It’s been a while since my last post. I typically don’t post during GenCon because there is so much news coming out. Now the con is over and things have quieted down some so here’s my interview with Chip Beauvais. 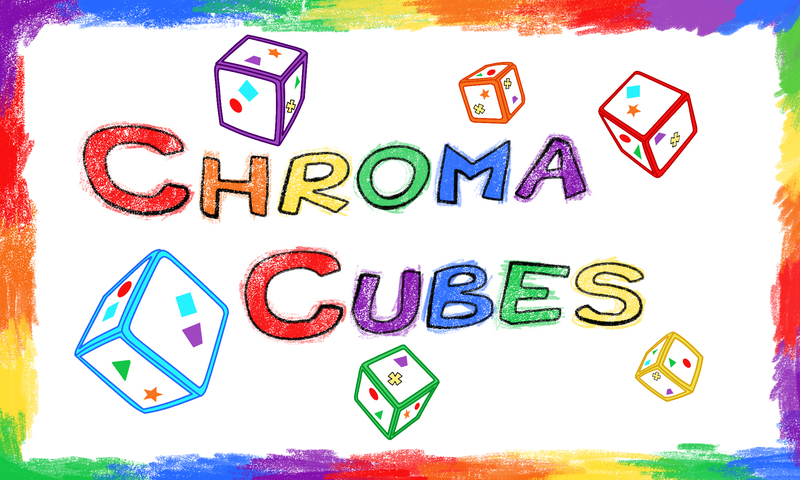 Chip is the designer of Chroma Cubes and has a new game called Smoke And Mirrors to be published by Button Shy Games. I hope you enjoy the interview. Tom: First, tell us a bit about yourself. Chip: Hi Tom! I’m a game designer (not my day job … yet) from Maynard, MA, where I live with my wife, daughter, and two bunnies. I started designing games a few years ago, and I haven’t yet found a way to stop. Tom: Your first game is Chroma Cubes. I got to playtest it and enjoyed it. Can you update us on what is going on with Chroma Cubes? Chip: I’m always happy to talk about Chroma Cubes. After a successful kickstarter campaign last fall, my publisher declared bankruptcy this spring. Fortunately, the rights to the game design have reverted to me, and I am actively seeking an alternate publisher. For people who’d like to try the game, there is a print-and-play version available on BGG: https://boardgamegeek.com/boardgame/162974/chroma-cubes. I also have a mailing list: http://flyingsheep.us9.list-manage.com/subscribe?u=9e1a301a8cbd22bad0dfd3aa5&id=9a22af666e where I send regular updates about my search for a new publisher. I also send additional new puzzles and variants occassionally. Tom: Now talk about Smoke & Mirrors. Chip: Great! I’m always happy to talk about my other games, too. Tom: Talk about how the game plays. Chip: A player puts down one or more cards from her hand of three cards, and claims that these cards add up to a specific number. The next player decides to either challenge her or not, and then repeats the process with the next highest number. If a challenge occurs, whichever player was mistaken is eliminated from the round. The last player standing wins the round, and then everyone starts again. I’ve skipped a lot of details here, but this is the core experience of the game. Tom: The illusionists theme is awesome. How did you arrive at that as your theme? Tom: Button Shy is publishing the game. How did that happen? Chip: Jason and I met at TotalCon years ago. He was impressed with Chroma Cubes, calling it the “Most Innovative Game of the Con” (https://boardgamegeek.com/blogpost/17578/totalcon-27-mega-recap ). Not too long after that, I jumped at the chance to create some games for his line of StoryTeller Cards. This standard deck of cards is very data-rich, which makes it a blast to design for. I had the germ of the idea for the main mechanism in Smoke and Mirrors years ago, but didn’t fully flesh it out. With the restriction of designing a game for ButtonShy’s wallet series, I revisited the idea to see if I could make it fit in only 18 cards. After some successful playtesting with a group at work, I submitted the idea to Jason, and the rest is history. Tom: Jason is a great guy and doing some really neat things with Button Shy. Who’s the artist? 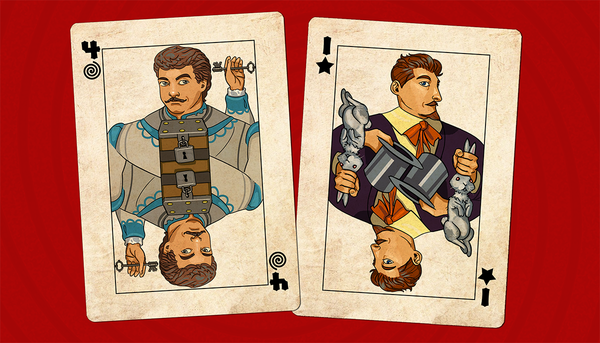 Chip: Fabrice Weiss created the artwork for the cards, and my wife, Sara Beauvais, created the cover for the game. Tom: What one piece of advice would you give aspiring game designers? Chip: Get your games out of your head and on the table as quickly as possible. Thinking about (and talking about) game design is fun, but only playtesting is productive. Tom: This board game community is so supportive and helpful. As a designer, not availing yourself to that is a poor decision. How have you tapped into that community? Tom: What is your current favorite game mechanic? Chip: It changes with each game I play! At the moment, deck-building. Chip: I don’t think I’ll ever turn down a game of Dominion. There’s a group of coworkers that play games once a week, and we’re exploring the Adventures expansion together. When we want to play something different, we play Lanterns. Tom: Did you make it to GenCon? Chip: Unfortunately, not this year. About a decade ago, my wife and I went to Gen Con for a few years. She was assisting Rebecca Guay, the artist. We even babysat her daughter one night at the convention. We had a great time, and look forward to going to conventions together again when our own daughter is older. Tom: What’s next in the queue? Chip: Promoting Smoke and Mirrors and finding a new publisher for Chroma Cubes takes up most of my free time at this point. While I don’t have anything else signed, I’m working on a slot machine deck-builder, as well as a few other ideas. Tom: That sounds really interesting. Would you mind talking a bit about it? Chip: I’d be delighted. Most people don’t think of slot machines as a game, as there are few (if any) meaningful decisions. However, if you could customize the symbols on the three reels (each represented by a deck of cards), you could give each player more control while retaining the giddy excitement inherent in slot machines. That’s the hope, anyways. Tom: How can people contact you? Chip: I’m on twitter @the_FlyingSheep, and you can email me (smokeAndMirrors at FlyingSheep dot com). Chip: Be sure to check out the other games that are part of this kickstarter. Fever Chill by Kenneth Thompson (http://buttonshygames.com/pages/fever-chill ) and North, South, East, Quest by JR Honeycutt (http://buttonshygames.com/pages/north-south-east-quest ). 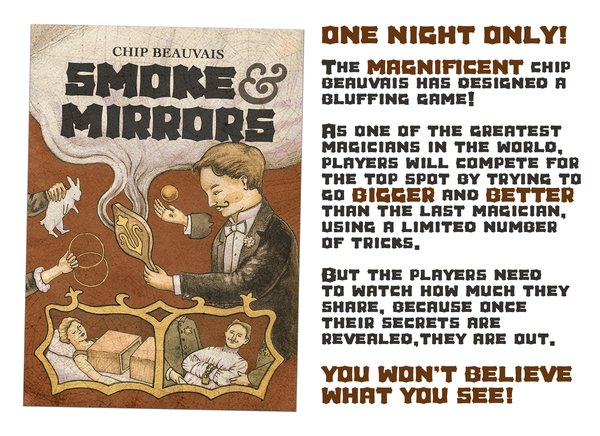 I hope you enjoyed learning about Chip and Smoke & Mirrors. I have received a prototype for review so look for that review soon. The Kickstarter for the game as well as two others as Chip mentioned is right here. Head on over there and check them out. Thanks for reading my blog. I very much appreciate it. Come back real soon.